A Southampton terrace has been badly damaged after fire broke out in a flat. Firefighters were called to the property in Mansell Road East, in the Millbrook area of the city, shortly before 2230 GMT. 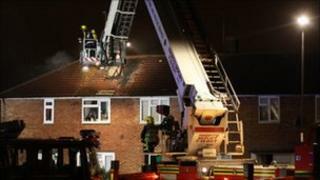 Hampshire Fire and Rescue said the fire started in a first floor flat and the flames quickly spread to the roof of a neighbouring property. About 30 firefighters were involved in the incident which was under control by the early hours. The four flats inside the building were evacuated. No-one was injured and an investigation into the cause has been launched.